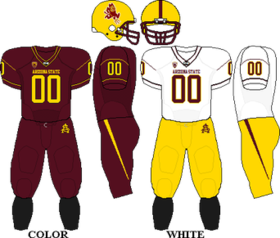 The 2010 Arizona State Sun Devils football team represented Arizona State University in the 2010 NCAA Division I FBS football season. The Sun Devils were led by head coach Dennis Erickson in his 4th season. They played their home games at Sun Devil Stadium and are members of the Pacific-10 Conference. They finished the season 6–6, 4–5 in Pac-10 play. Despite a .500 record, the Sun Devils were not bowl eligible due to two wins over teams from the FCS. On September 25, 2010, Oregon defeated Arizona State in Tempe, Arizona by a score of 42-31. Though a night game, kickoff temperatures for the game soared at 100 degrees Fahrenheit. Arizona State took an early lead in the game, but Oregon responded with a season-high 4 team interceptions. The Sun Devils held primary running back LaMichael James to only 114 rushing yards, but the total was enough to move James past the 2,000 yard mark for his career. Oregon quarterback Darren Thomas had 290 passing yards in the game, including a 61-yard pass to tight end David Paulson, which were career longs for both players. The win was sufficiently impressive to Associated Press voters to move the Ducks from 5th to 4th (past TCU) in the September 27th AP Poll. California faced Arizona State, who was coming off a bye week and looking for their first win in Berkeley since 1997. Although Sun Devils quarterback Steven Threet completed passes of 44 and 26 yards on the opening possession, Arizona State had to settle for a field goal, after which Cal took control of the game. The Bears responded with a drive that also resulted in a field goal, then intercepted Threet deep in Cal territory, but couldn't capitalize on the turnover. After forcing a three and out, Cal took advantage of a 28-yard punt return by wide receiver Jeremy Ross that gave them great field possession on the Arizona State 28-yard line. The Bears took advantage of two Sun Devils penalties with Shane Vereen scoring the game's first touchdown on an 8-yard run. Cal scored again to open the second quarter on a 4-yard pass from Kevin Riley to wide receiver Keenan Allen, with the PAT being blocked. Riley then connected with wide receiver Marvin Jones for a 52-yard score. A 37-yard field goal attempt by Arizona State missed, while Cal made one from 23 yards to put the Bears up 26 to 3 at the half. Backup quarterback Samson Szakacsy stepped in for Threet, who had been injured. The Bears scored to open the second half on a 5-yard run by Vereen. Two minutes later, the Bears blocked a Sun Devils punt, which was recovered by defensive back Chris Conte for a 7-yard score. Arizona State in turn was able to block a Cal punt for a 1-yard touchdown by linebacker Oliver Aron. Cal opened the fourth quarter with a field goal, then scored on a 19-yard run by wide receiver Jeremy Ross. The final score of the game came on a fumble by backup quarterback Brock Mansion which was recovered by linebacker Brandon Magee for a 26-yard score. Kevin Riley threw for 240 yards and two scores, while Shane Vereen rushed for 91 yards, tying him for fifth place in career rushing touchdowns with Justin Forsett, while wide receiver Marvin Jones had 110 receiving yards and a score. Steven Threet threw for 130 yards with two interceptions and Szakacsy able to only manage 66. The Sun Devils were held to 51 rushing yards. Arizona State quarterback Brock Osweiler threw 4 touchdown passes while UCLA quarterback Richard Brehaut had three. The victory ended UCLA's hope of a bowl game in December. ^ "Portland State Vikings vs. Arizona State Sun Devils Box Score". ESPN. September 4, 2010. Archived from the original on September 7, 2010. Retrieved September 5, 2010. ^ "Northern Arizona Lumberjacks vs. Arizona State Sun Devils Box Score". ESPN. September 11, 2010. Archived from the original on September 15, 2010. Retrieved September 12, 2010. ^ "Arizona State Sun Devils vs. Wisconsin Badgers Box Score". ESPN. September 18, 2010. Archived from the original on September 21, 2010. Retrieved September 19, 2010. ^ "Oregon Ducks vs. Arizona State Sun Devils Box Score". ESPN. September 25, 2010. Archived from the original on September 29, 2010. Retrieved October 3, 2010. ^ "Arizona State Sun Devils vs. Washington Huskies Box Score". ESPN. October 9, 2010. Archived from the original on October 12, 2010. Retrieved October 10, 2010. ^ "Arizona State Sun Devils vs. California Golden Bears Box Score". ESPN. October 23, 2010. Archived from the original on October 25, 2010. Retrieved October 23, 2010. ^ "Washington State Cougars vs. Arizona State Sun Devils Box Score". ESPN. October 30, 2010. Archived from the original on November 2, 2010. Retrieved October 30, 2010. ^ "Arizona State Sun Devils vs. USC Trojans Box Score". ESPN. November 6, 2010. Archived from the original on November 9, 2010. Retrieved November 7, 2010. ^ "Stanford Cardinal vs. Arizona State Sun Devils Box Score". ESPN. November 13, 2010. Archived from the original on November 17, 2010. Retrieved November 13, 2010. ^ "UCLA Bruins vs. Arizona State Sun Devils Box Score". ESPN. November 26, 2010. Archived from the original on December 1, 2010. Retrieved November 26, 2010. ^ "Arizona State Sun Devils vs. Arizona Wildcats Box Score". ESPN]]. December 1, 2010. Retrieved December 2, 2010. ^ a b "Riley, Vereen lead California in 50-17 rout". Yahoo!. October 23, 2010. Archived from the original on November 20, 2015. Retrieved October 23, 2010. ^ "Arizona St. at California - Play by Play". Yahoo!. October 23, 2010. Retrieved October 23, 2010.